I’m a big fan of shower scrubs. They’re fast, easy to make and leave you with a delightful pampered feeling. What I’m not a big fan of? Planning ahead. So it’s usually after I’m showered and getting dressed that I realize, holy mackerel, exfoliation needed, stat! Enter sugar scrub cubes. This is genius, folks. The benefits? You whip them up whenever the scrub-making urge strikes. They aren’t all gloopy and gooey. They’re the portioned out to just the right size. Mix the oil and shredded soap together in a microwave safe bowl. Microwave on high for 10 second intervals stirring in between each. Continue until the soap is melted into the oil. Add in optional scents or other ingredients and stir. Quickly move mixture to a mold and let firm up (putting it in the freezer helps). The optional stuff is my favorite part. Here are three fall flavors we tried out. 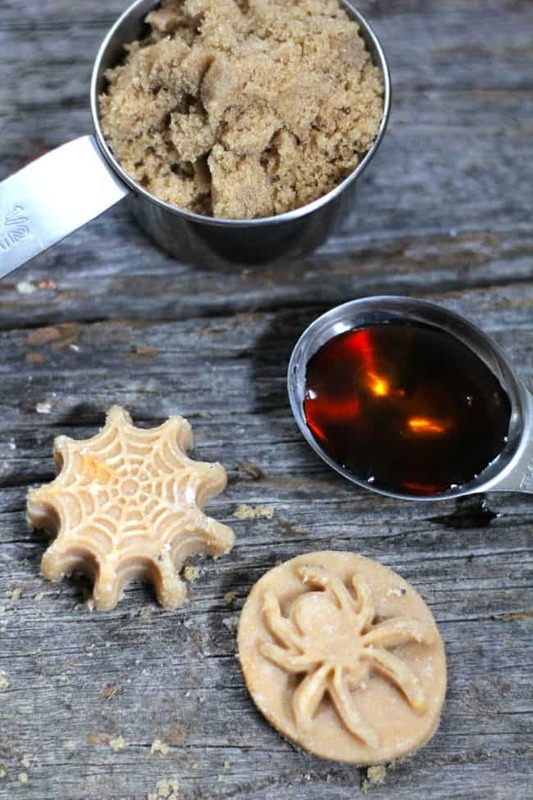 Replace the white sugar with 1 cup of brown sugar and add 1 tablespoon of maple syrup. Coffee is great for cellulite! Mix in 1/4 cup coffee grounds and 1 tablespoon of vanilla extract. We couldn’t not do a pumpkin version. Add 1 tablespoon of honey and a heaping teaspoon of pumpkin spice. 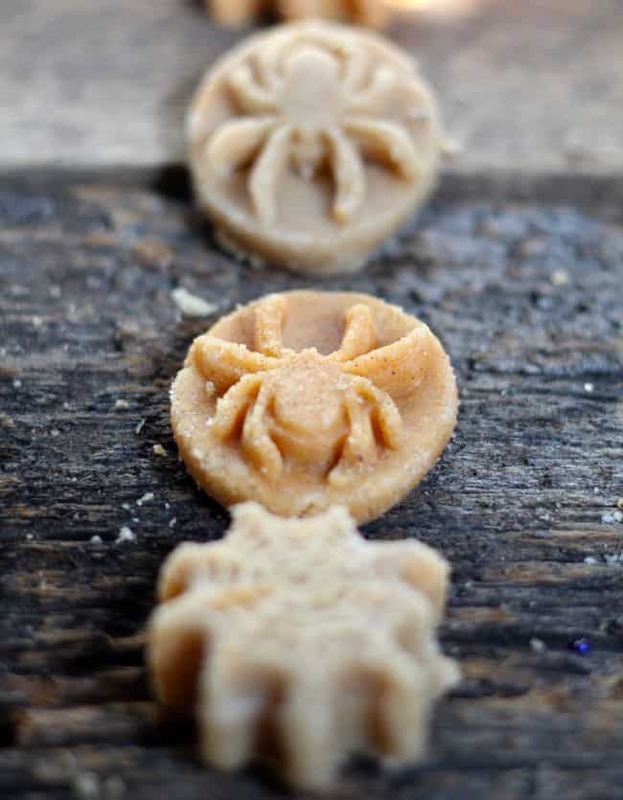 You can use fun molds (like this spider and web one last seen in our Halloween bath bombs). When the scrub is firm, pop them out of the mold and keep them in a covered container until ready to use (otherwise they will dry out and crumble). Then take a couple of cubes into the shower and crush them a bit in your hand under the water. Then scrub away! 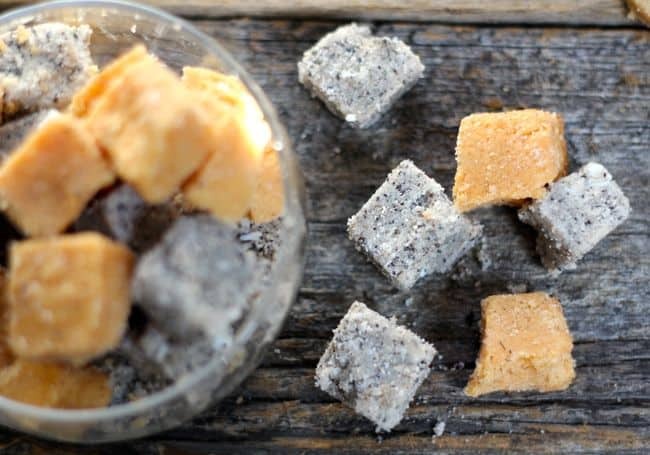 Have you ever tried a sugar scrub cube? Did you love it? My cubes won’t hold their shape. I have tried a few times. Do you have any ideas on why they won’t hold their shape? I want to make these using my essential oils. How many drops do you think I should use? These worked really well for me. Thank you for sharing!! With using vitamin E, what would the approximate shelf life be? Whats the shelf life on these? I tried making these, but even though I put them in the freezer for 6 hours they won’t keep their shape. What do I do now? Do I have to start from scratch? I tried to make them but i moisten my hand and nothing really happened. I used glycerin soap and I followed the recipe and use Valentine molds. What did I do wrong? Made Coconut lime sugar scrubs, and they smell so yummy. Thanks. Hi my hubby is allergic to most soaps is there anything else that I can substitute? What about just plain glycerin? You can get it at a craft store like Michael’s in the soap making aisle. I have extremely sensitive skin (allergic to aloe of all things!) and I’m fine with plain clear glycerin. Also Beeswax may be a good substitute! It locks moisture in and is super gentle. 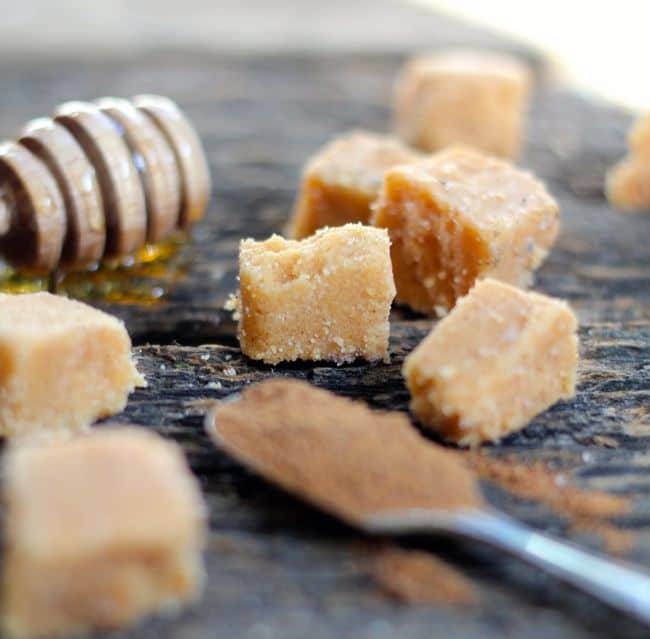 Courtney…Beeswax is a great idea for the sensitive skin! My skin is freaking out right now. So, I just made oatmeal, honey, brown sugar scrub flowers in a shea butter base with almond oil. Fingers crossed it will help. I think these will be great for shaving! So this has been asked already but not answered. Is the shredded soap measured to just 1/2 cup or is it measured by weight? I also had the same problem with some soap I had that I shredded and it didn’t melt either. SO when you use melt & pour soap, how is THAT measured? If you weigh what a 1/2 cup of soap would be it works out to over a cup 1/2 of shredded soap. That’s a huge difference. Also I would assume if you just measure shredded soap you don’t pack it. Is that right? Thanks. What is the verdict on the coffee grounds? Used or unused? Can’t wait to make these! I’m thinking Vanilla Peppermint would be lovely too! I’m no expert but i had a slight obsession with diy body products for years…I read (and again, it’s been awhile so I don’t know the exact source) that you make a pot of coffee and then get the used grounds out of the filter, and I always put them in the refridgerator for a few minutes before using. Hope this helps.. Thank you so much for that information as I was grossed out to the use of used coffee grounds. Just on general principle, I agree, used coffee grounds is an invitation to trouble. I made these tonight and used a K-cup from the morning. It seemed to have worked fine. I’ve attempted to make these several times. I keep ending up with items the consistency of gummy drops that will not retain their shape. I tried using coconut oil thinking that would help, but they are still very soft. Not sure what I’m doing wrong. 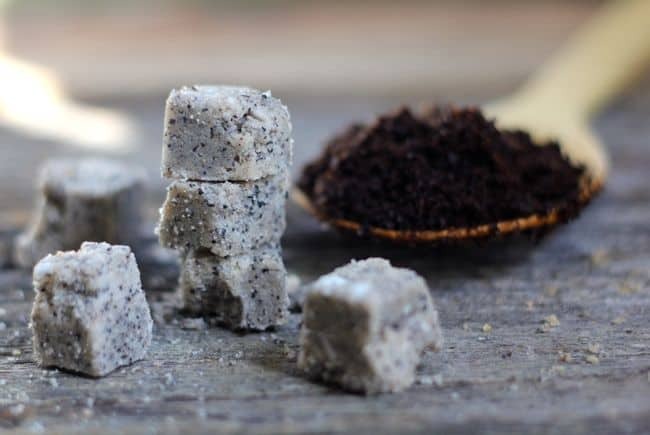 The recipe just says “soap” but all other recipes that I’ve found for this type of scrub cube specify “melt and pour soap”. The melt and pour soap makes it harden and retain the shape. Everything I need lives in my kitchen but the soap and I’m kind of wondering what it’s in there for? Can these be made with out it? I have made the vanilla coffee ones several times now and I really like them. I do heat the coconut oil and shredded soap for quite a while (30+ minutes) in a double broiler and the soap does not melt all the way. I use an unscented bar of soap that I make using the cold process method. Since it doesn’t melt all the way, there are little pieces of soap left in the cubes which gives you some lather with the scrub. Thank you for the recipe! Is the measurement for the soap melted or shredded? Can you use cooking oil or no oil at all for body scrub ? Just tried this and ran into a road block right away. The soap doesn’t melt into the oil? I even tried putting it on the stove and the oil just got hot and the soap stayed in shavings. I think you may need to use a melt and pour soap base for these. There are a few different varieties on Amazon or may be available at your local craft store such as Jo-Ann’s. I am a soap maker. You have to melt the soap also, and then add it to the oil. Different liquids and solids melt at different temperatures. You will see a big difference. Also adding a little bit of essential oil will give it a nice scent. 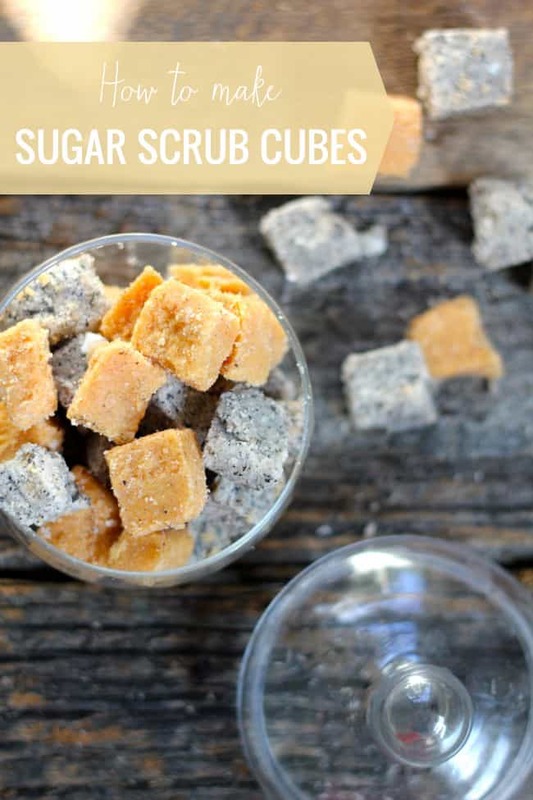 I want to make some scrub cubes as christmas presents. I have no idea what i’m doing. How many cubes do your recipes make and can i get these ingredients locally (ottawa) or should I order online? What is the shelf life of these cubes? Will they mold since sugar is in them? Sorry if that’s a dumb question! If you add a little vitamin E they will have a longer shelf life, it’s a natural preservative, a very mild one ;) I’d say maybe 4 drops per cup of sugar or so. Just a question, can you use vegetable oil? Anything you can use olive oil for you can normally use vegetable for however I notice vegetable has a ‘cooked’ smell when heated :/ Just my opinion. From what I have been told by my dermatologist when I told her that I make my own lotions and scrubs is that to always make sure whatever oil you use is First pressed or cold pressed and ALWAYS unrefined. I’d be careful. I always use organic olive oil or Coconut oil for my lotions and scrubs. Could liquid castille soap be substituted for the shredded soap? Hi, with what other kinds of oil can I replace the Coconut oil? (Coconut and almond oil are very expensive in my country!). Thank you! im pretty sure that you can use oils such as olive oil and canola oil just along with vegetable oil. I just made some with grapeseed oil and they’re fine. Its cheaper on Amazon. Even a small bottle of almond oil makes 4 batches of sugar scrub cubes. Its expensive to buy in larger sizes but not in smaller bottle. Its my favorite. Good luck. P.s. u can also use a grapeseed oil blend from the market. Avocado Oil, Jojoba oil – those should work ok, not sure what IS available in your country so not sure which f the available oils would be a good substitute. Due to varying thicknesses of oils you just have to play w the measurements. What kind of shredded soap do you use? I have some Dr. Bronners bar soap, Kirk’s Castile Soap, and a Yardley of London Soap. Would any of these be okay? Or do I have to use a Melt and Pour Base? Hi! These are great – thanks! I did have a problem however… My coconut oil wouldn’t incorporate – just sat in a stubborn little layer on the top… Any advice? Sorry if this is a dumb question, but do you add the sugar while you’re adding in the scents or other ingredients. Great question Helen! Yes, that’s when you add the sugar – thanks for clarifying! I’ve never tried a sugar cube before, but I love the ideas that you posted! Thanks!! Should I measure the soap by weight (4 oz) instead of w/ a 1/2 cup scoop? I used she butter soap from Michaels… I also omitted 1/4 c sugar and replaced it with 1/4 cup dry coffee grounds.. I have been wanting to make these! Can I use bath whip instead of the shaved soap? I’m making some of these. Is the coffee used? What type of container have you found to be the best for storage? Thanks so much!!!!! Were the coffee grounds fresh or used? I 2nd ‘Hello Christmas Gifts’!!! I will try tonight and post some feedback in preperation for the Christmas batches! just the perfect thing for quick exfoliation! it happens with me as well, I realize afterwards that I need to exfoliate ! What a brilliant idea Stephanie! I love the sound of the vanilla coffee version. My God..they look almost edible! These would be a great gift! And your photos are beautiful! what a great and fun idea !